Cooling or Heating Jackets readily available using the shell of the next size of unit larger than the damper size that you need, as the jacket. Like all other PulseGuard Ltd. Pressure Pulsation Dampers, and Flow Fluctuation Preventors PipeHugger LP is available in both heating/cooling jacketed form, (1) and also with a piping system base block (2). For dimensions of jacketed Dampers use those of the next larger size, the jackets are generally from the shell of the next larger Damper. Note the flow through configuration which ensures constant temperature. Piping system base blocks are available in all machinable material with any connection orientation and flange or thread type. 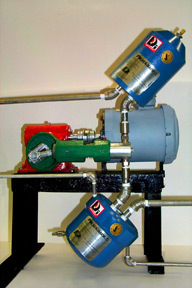 They are often used as a transition from pump manufacturers standard to the piping system standard (3). Note: Base blocks provide ease of mounting, and the ability to change the damper in minimum down time and without disturbing piping integrity.